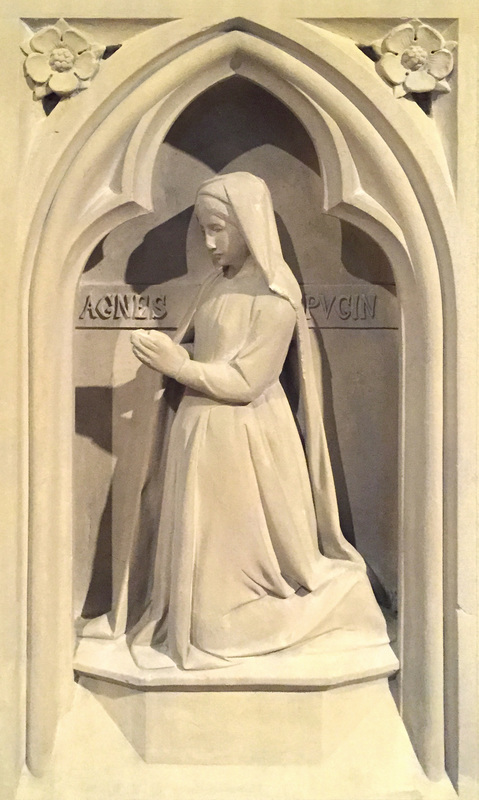 Agnes was born at what was then the Pugin family home - St Marie’s Grange, Salisbury - on 13 October 1836, an auspicious day, Pugin might well have thought, as it was the Feast of St Edward Confessor, Patron of England. She was the second child of Pugin’s marriage (1833) to Louisa Button, the first being Edward, now aged two, and there was also the four-year-old Anne, the only child of Pugin’s first marriage to Anne Garnet. Little is known of Agnes’ childhood. Louisa died in August 1844, and shortly afterwards Pugin settled his six motherless children into the new home he had built – The Grange at Ramsgate. When, four years later, Pugin married his ‘first-rate Gothic woman’, Jane Knill, Agnes did not take to her new stepmother, and it seems that the feeling was mutual. So, in October 1848, just a few weeks after the marriage, Agnes – now aged twelve - was sent to school at Caverswall Castle in north Staffordshire, under the strict régime of the Benedictine nuns. This placed her far enough away from Jane during term-time, but Pugin was able to call and see her during his periodic visits to nearby Alton Towers. Agnes was not very happy at the school, and was troubled with ill-health. ‘I have just been over to Caverswall,’ Pugin told John Hardman after one such visit, ‘poor Agnes is very ill..... it is sad to see her. she will now appreciate the comforts of home.’ For her part, Jane hoped that Agnes would ‘alter very much before she leaves for good, otherwise I do not know what I shall do.’ Agnes seems to have had some musical ability, and her father encouraged her to practise on the organ at St Augustine’s, Ramsgate. After Pugin’s death in September 1852, Jane and her family moved first to Birmingham, and then to a house in Gordon Square London. Agnes chose to remain in Birmingham, living with her elder step-sister Anne, who was married to Hardman’s chief designer, John Hardman Powell. Though she was evidently very close to both of them, she was headstrong and not one to take advice readily. ‘A curiousity’, Powell said of her. ‘Ordinary rules will not apply in her case.’ When the Pugin family moved back to The Grange in 1860, Agnes went with them. 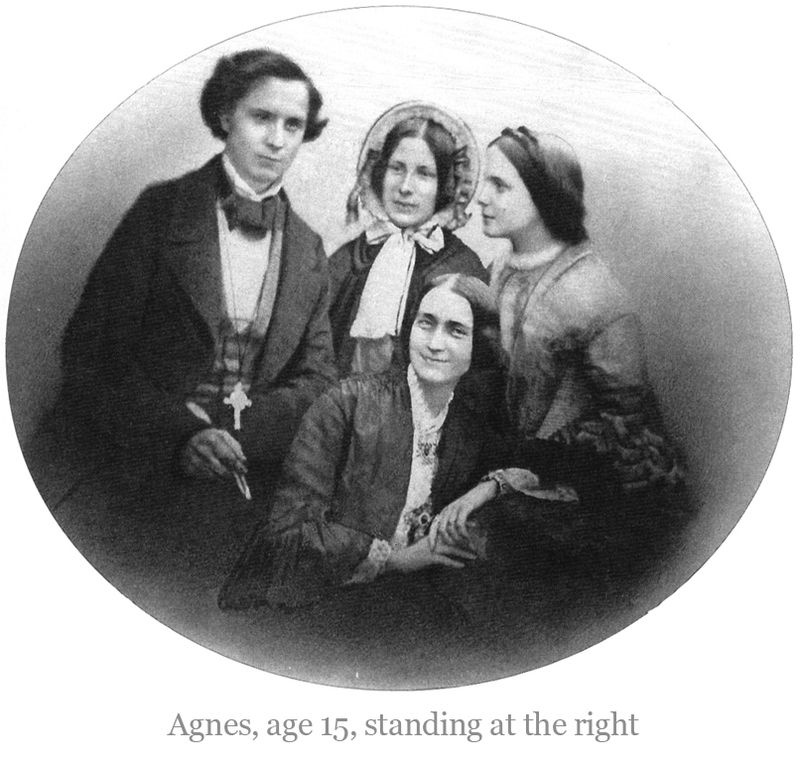 A family group photograph dating from about this time (as shown at the left) shows her to have been an attractive young woman, and it is not suprising that she had several suitors. One of these was the budding architect Edmund Kirby (1838-1920) who was then undergoing some training at Hardman’s, and a relationship developed, leading almost to the point of marriage. For some unknown reason, the fickle-minded Agnes – whom Powell nicknamed ‘the fiery one’ – broke it off, much to Kirby’s distress. Amongst other suitors was solicitor Lewis Frederick Peniston (1834-1872), son of John and Mary Peniston of Vaux Court, Salisbury, whom she married on 3 February 1863. The marriage took place at St Augustine’s, Ramsgate, with the Bishop of Southwark,Thomas Grant, officiating, and a grand reception took place at The Grange afterwards. After their marriage Lewis and Agnes settled for a time in Liverpool, where their two eldest children – Maud and Hilda – were born; then moved back to Ramsgate, to a house in Augusta Road. Two of their children died in infancy: Augustus Lewis Edward John, who died aged six months in August 1869, and Augusta Annette Emma who died three years later aged only four months. Then, in November 1872, Lewis Peniston died very suddenly at the age of 37, leaving Agnes a widow after only nine years of marriage, with three small children to bring up by herself on slender resources. Following the death of her brother Edward in 1875, Agnes contested the settlement of his estate as drawn up by Powell and Jane Pugin, and agreed by the rest of the family, believing that she was entitled to more than had been allocated to her. Bitterness towards Jane re-surfaced. As Jane told Powell, ‘She told someone once she knew she was a thorn in my side and she always intended to be..... I think she has truthfully carried out her threat.’ Having returned to Salisbury for a time, Agnes later moved to London where she died on 16 May 1895. She was buried alongside her husband in the Pugin chantry at Ramsgate.